Rotherham-based PMS Diecasting Ltd has been recognised for its continued innovation in zinc diecasting. PMS Diecasting has been producing high quality zinc diecastings for nearly four decades and is one of Europe's leading diecasters. It produces around 50 million castings annually for the global manufacturer, Gripple. Incorporated in 1978, PMS Diecasting developed a precision manufacturing process to produce handsaws that proved so successful that every DIY retail outlet and most handtool distributors sold an "own brand" saw which was made and branded in Rotherham. In just five years PMS became the largest volume manufacturer of handaws in the UK. Having moved to a larger facility in Hellaby, the firm continues to innovate, not only with technology but through a company culture based around employee ownership and creating a family feel. 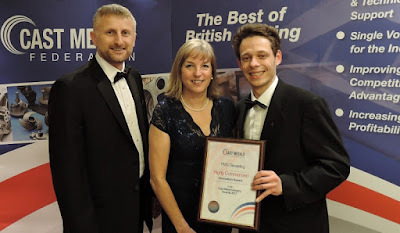 At the recent Best of British Castings Industry Awards Dinner, PMS were highly commended for its innovation. Shortlisted in the innovation category, the company has, together with a German partner, successfully produced a hot runner zinc diecasting tool, a first in the UK. The tool is designed to increase productivity and reduce the unit cost of the Gripple, a zinc cast fencing jointing system used throughout the world and produced by the company in vast quantities. Pam Murrell, CEO of the Cast Metals Federation, said: "This new tooling assembly has great potential to substantially reduce cycle times and improve casting yield by dramatically reducing the amount of metal in the runner, thereby improving energy efficiency and also reducing post processing of the parts. The quality of the components produced is also significantly higher than conventionally produced parts. I am pleased that this was recognised by the judges, by their shortlisting of the PMS entry." Alongside Gripple and other local companies, PMS is part of a group of employee-owned companies where each employee is a shareholder member. GLIDE (Growth Led Innovation Driven Employee-Owned) is the central body that represents all the shareholder members who work in its partner companies. The Gripple system is used for joining and tensioning in fencing and has gone on to have success in signage and architecture.